It seemed like the scoring would never end. The Pens and the Canadiens combined for 13 goals in an exciting, entertaining and thrilling barnburner on Saturday in front of a raucous crowd at the Bell Centre, with Brandon Sutter scoring the winner 52 seconds into overtime to give Pittsburgh a wild 7-6 victory over Montreal. "If you ask both teams, it’s probably not the best way to win a game when you give up six goals," Sutter said after the game. "But on the end of a road trip like that, I think it’s a great win. We still felt we played pretty well. We have to get a little tougher around our own net to keep some pucks out, but it’s a good win and it feels pretty good." This game wasn’t pretty and the Pens still have a lot of work to do in improving their D-zone coverage, but two points are two points and this pair is especially meaningful. That's because the Pens broke their two-game losing streak, ended their three-game road trip with a win and return to Pittsburgh with a big win over one of the top teams in the East. Most importantly, the Pens triumphed in a game that was back-and-forth, up-and-down, exhilarating, frustrating, frenetic and stressful. They stayed focused and battled back from a pair of what could have been backbreaking Montreal goals in the second period (one coming with 0.9 seconds left to tie the score 4-4) – and dealt with more of the same emotions in the third – to get the win. “This was obviously an up-and-down game ... Just all over the map," Penguins coach Dan Bylsma added. "Maybe our best game in terms of sticking with it and staying with it and not deviating. We were able to get the (tying goal) and also get the goal in overtime." Sutter, Cooke and Chris Kunitz all had two-goal efforts while Sidney Crosby also scored for the Pens. Kris Letang finished with a career-high four assists. Tomas Vokoun made 33 saves for Pittsburgh. (The full game summary can be accessed here). A few weeks ago, Brandon Sutter scored a big goal in a wild game when he beat Flyers goalie Ilya Bryzgalov with 2:03 left in regulation to tie the score 5-5. But his chance to be the hero got stolen from him when Jakub Voracek completed a hat trick 32 seconds later to give Philadelphia a 6-5 win. Well, Sutter got another chance to be the hero on Saturday in Montreal when he got the puck in the slot less than a minute into sudden death. And this time, it didn’t get taken away from him. The play started when Simon Despres and James Neal broke the puck out of the Pens D zone and into the other end. Despres – playing his first game in front of his family and friends from Montreal – saw Sutter coming in late and hit him with a pass. Sutter juked around a Habs defender and beat Price cleanly with a perfect shot – his second of the game. "'Nealer' drove the middle and kicked it wide to (Despres)," Sutter explained. "And he just found me as the wide guy. I just had one guy to step around and I just tried to put my head down and shoot it. So it worked out good and it felt pretty good, too." This was the third two-goal game of Sutter's career, his last one coming Jan. 24, 2011 vs. Toronto. Sutter was flying all game, leading the Pens with seven shots – tying his career-high set one other time, on Dec. 23, 2009 vs. this same team. He worked hard tonight, and got a fitting reward. After finishing the first period with one goal each, the Penguins and Canadiens combined for six goals in the second period to make it 4-4 entering the third. 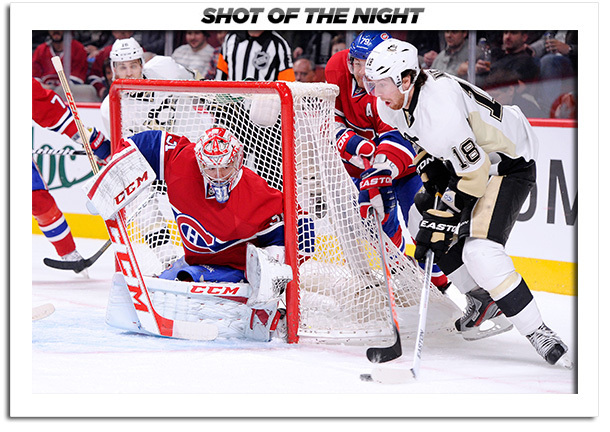 After the Canadiens scored first in the frame, the Pens responded with three unanswered goals to build a 4-2 lead. But Montreal responded to that with a pair of backbreaking goals – one coming with 2:23 minutes left and the other coming with 0.9 seconds left in the period. Talk about the Canadiens entering the third with momentum. "I think there’s some disappointment there and there’s some emotions of getting back even there after being up 4-2," coach Bylsma said. "We certainly don’t like how it happened, but we really had to get back focused and get ready to come out for a road third period, not really dwell too much on the mistakes that we made. Obviously an emotional drop from our team and in a tough place to play, I thought we did a good job of coming out hard in the third and getting two points on the road." Absolute credit goes to Pittsburgh for staying focused, finding a way to rally from that and come away with the win. They'd had a tough two games coming into this one, and it would have been easy for them to get discouraged and give up. But the Pens stuck with it and got the OT win. "Honestly, when a team scores two quick goals like this at the end of a period, it always hurts," Letang said. "But we had a good meeting yesterday and a good meeting this morning about staying focused and staying put. I think guys did a really good job." "It’s hectic," forward Matt Cooke added. "You think you’re playing a good game and the score is 4-4. It just doesn’t make any sense. But we found a way to win and that’s what’s most important." This game was certainly exciting for the fans, but Letang gave a very candid answer when our own Sam Kasan asked him just what it’s like to play in a game like this – is it fun for the players? Letang finished with four points (four assists), a new single-game career-high for the Montreal native. But he gave another candid answer when asked about the new personal best. If it’s stressful for the players, just imagine what it’s like for the coaches. That’s exactly what Sidney Crosby, Kris Letang and Chris Kunitz did to get their team back in this one. The three players combined for the Pens’ last two regulation goals. The first one tied the game 5-5 with 11:27 left in regulation and the second gave Pittsburgh a 6-5 lead with 9:36 left in the third (Montreal would soon tie it 6-6 to send the game to overtime). Letang worked hard along the boards on both plays. On the first one he pinched deep into the zone and went behind the net. He managed to push the puck over to Crosby, who found Kunitz in the slot (he had been covering the point for Letang, but wisely sneaked into open space). On the second one, Kunitz gave a pass to Letang and he again carried behind the goal line. Kunitz followed and the two of them battled hard on the boards to keep possession. Letang came away with it, got it to the net and keep whaling away at the rebound. The puck squirted right to Crosby, who was hovering at the net, and he slammed it in. Crosby was spectacular all night – on Kunitz’s first goal, he made a sick play to kick a pass up to his stick using his skate to get a shot on net. He then got his rebound, went behind the net and waited patiently before giving a short little pass to Kunitz at the post for the score. Bylsma adjusted his lines slightly for Saturday’s game. He moved Pascal Dupuis back with Crosby and Kunitz and put Cooke, Sutter and Neal on a line together. It worked out on the scoresheet, as those two lines starred offensively for Pittsburgh. In addition to Sutter, two other Pens had two-goal nights. Cooke was the first to score a pair, with both his goals coming in the second period. Both tallies came because Cooke didn’t hesitate to shoot the puck – and got help from his linemates. On the first one, Neal provided a nice screen on a bad-angle shot from Cooke. On the second, Sutter won a center ice faceoff forward and Cooke found space in the slot. He quickly snapped it past Price. Kunitz also scored a pair and added an assist, extending his point streak to five games – which equaled his career-long stretch. Kunitz has five goals, three assists and eight points over his streak.